Flagstone (also simply known as 'flag') is natural stone quarried into flat slabs. 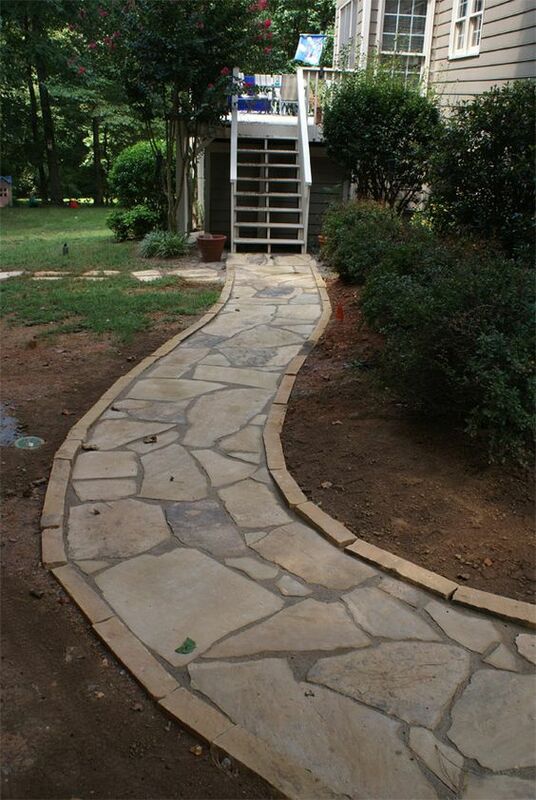 Flagstone is usually used for paving slabs or walkways, and patios. Typical flagstone has a smooth surface with variegated colors in are red, blue, and buff. Thick flagstone is irregularly shaped, 2" to 3" thick, smooth surfaced stone with variegated swirls of color. Mostly used to provide a little bit stronger load-bearing surface, such as high traffic walkways. Medium flagstone is irregularly shaped, 1" to 2" thick. Most commonly used for patios and walkways either with or without a bed of mortar. It is also used as coping around ponds. If you plan to use it for a patio you will need about 16 to 18 lbs per square foot of patio. This flagstone is irregularly shaped, 1" or less. Most commonly used for mortaring onto concrete block as a veneer. It is also used as coping around small ponds. It is generally not suitable for walking on because it is so thin. Don't need a full pallet? You can pick out & purchase individual pieces of stone at our store. 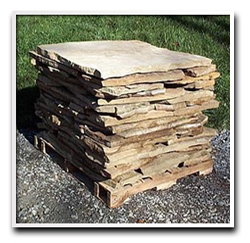 Stacking flagstone is irregularly shaped, and available in several thicknesses. Most commonly used for stacking walls with or without mortar, and as a veneer with the pieces mortared to masonry block. Comes from flagstone slabs that are 2 1/2" to 6" thick that are broken into 4" widths and varying lengths. They are very nice for stacking walls or as edging around patios or plant beds. Flagstone stair treads are cut on a stone breaker from large slabs. The treads range from 2 1/2 feet to 3 feet in length and 18" wide. The riser dimensions vary slightly from 5" to 6". Each slab weighs from 280-310 lbs. so you will probably need to use a little Egyptian technology to set these stairs in place. That means you only pay for what you choose to buy, whether it's a pallet of flagstone, a single stair tread or ten pieces of rubble. Step stones are cut from 1.5" — 3" thick flagstone slabs into squares and rectangles (not necessarily exact 90 degree angles). Step stones are available in various colors, and sizes are 12x12, 12x18, 12x24, 18x18, and 12x24. These stones can be laid in the ground to create single steps or patterned together to make patios. Many people also use them as capstones for stacked walls. Our stone benches are sold as a 3 piece set (2 legs and a seat). It is cut from 3" stock with the bench being 15" wide and 36" to 38" long. The edges are hand chiseled (pitched) to provide a finished, rounded appearance. Ask us how to install these - we'll be happy to ensure you know how to do it properly. Produced from flagstone slabs that are broken into rectangular brick-like sizes and then tumbled in a machine to smooth the edges. The product is excellent for stacking walls or as edging around patios or plant beds. Yes, I want to pick out my own!